Years of war and genocide. Hundreds of crayons. And one pediatrician who made a difference. Helicopters attacking villages. Armed troops burning homes and shooting children. Houses on fire as planes roar through the sky. The crudely drawn pictures show the horrors of war through the eyes of children in in two of the world's most violent places: Sri Lanka and Sudan. Dr. Jerry Ehrlich, a pediatrician working with Doctors Without Borders, brought back home hundreds of these drawings. This is his story and the stories of countless children, devastated by war. How Can You Go Home Again? 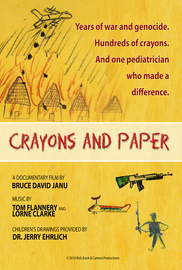 This bundle includes downloads of the films Crayons and Paper and Facing Sudan. This bundle includes the HD Facing Sudan download, the Special Edition DVD and a Facing Sudan Poster. As a bonus, a Crayons and Paper download.